Creating pathways for equestrians to experience the outdoors with their horses is Susan Stormer’s horse-related career. Many of us only wish we could earn a living riding horses through forests and across beautiful landscapes, but Susan Stormer has found a way to do just that. She developed her skills for building trails as she completed a doctorate in clinical psychology. Soon after, she and her husband made this passion their business and created S&S Trail Services, LLC, based in Austin, Texas. With a vocation that enables her to help fellow equestrians and outdoor enthusiasts enjoy their recreation time, Stormer appreciates her chance to work both in nature and to help protect it. Here she shares with us how she achieved her career as a trail builder and what it takes to do the job well. 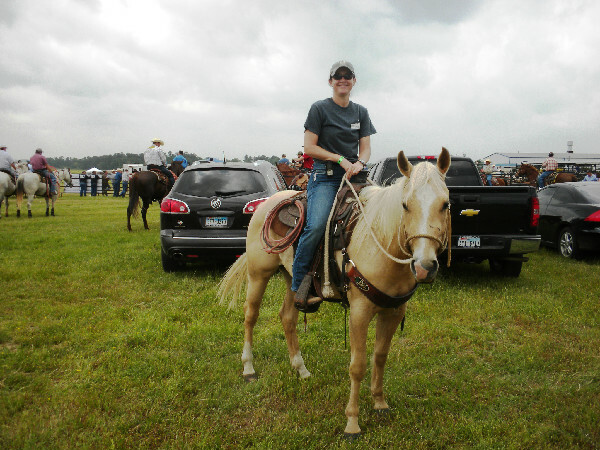 Susan Stormer often gets to ride horses as part of her trail building career. Karen Braschayko for Equitrekking: What is your background with horses? Susan Stormer: I was your typical horse-obsessed young girl who owned Breyer figurines, drew pictures of horses on all my school notebooks, and read as many books about horses as my parents could give me. I took my first horseback riding lesson as part of a summer day camp at age 10, and for my 11th birthday my parents gave me weekly riding lessons as my present. That changed my life! Soon after that I joined the United States Pony Club chapter near my home. Eventually, I began showing hunter jumpers and competed in combined training events. Mom and Dad bought me my very own horse when I was 13, and I owned Maisy until I had to sell her when I went off to college. Since then I have continued to ride, although on a much less frequent basis due to my frequent business travel. I also focus on a more casual style of riding than I used to, and I do a higher percentage of trail riding than in the past. Being out of the arena and riding in nature is a very positive experience! Equitrekking: How did you develop your career in trail building, and what inspired you to start a business? Susan Stormer: Although I did some trail riding during my younger equestrian days, I really became an active trail user after I started mountain biking in 1995, while I was in graduate school in Florida. After riding my local trails and getting so much enjoyment out of them, I wanted to give back to the community by participating in volunteer trail maintenance and trail building activities. When I moved to Austin, Texas, in 1998 to complete my postdoctoral studies, I continued my involvement in the mountain biking community. I kept doing trail work and maintenance. During that time I had met my boyfriend Ryan, who is now my husband. Working with a mentor in 2003, we created a nonprofit program called the BikeTexas Trail Doctors. The program was funded by a grant from the Texas Parks and Wildlife Department (TPWD), and it was a very exciting and educational experience. We both quit our jobs, rented out our condo, sold a lot of stuff, and found a new home for our cat. For the next four years we traveled the state of Texas full-time, offering consultation and training services on sustainable multi-use trail design and construction techniques. Building recreational trails takes a lot of sweat and dedication, but Susan Stormer loves her outdoor work. Eventually, due to federal funding changes and budgetary constraints, the grant that supported our program came to an end. The salary was pretty small (about half of what Ryan and I had made in our prior careers), but we loved getting paid to do our hobby. We were motivated to figure out a way to create income for ourselves doing a similar line of work after the grant funding dried up. We wanted to become more active in hands-on trail construction, so in 2006 we decided to become partners in a trail building business started by a colleague. Then in 2008 Ryan and I struck off on our own and started S&S Trail Services, LLC, the company we own and manage today. Equitrekking: Tell us about your company. What services do you offer? 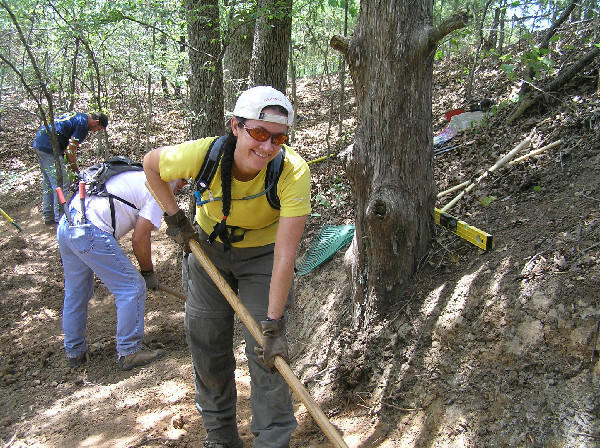 Susan Stormer: S&S Trail Services, LLC is an owner-operated company based in Austin, Texas, that offers services including education, consultation, design and construction for sustainable natural surface, multi-use trails. We build trails primarily for non-motorized users and focus on creating great experiences for hikers, mountain bikers and horseback riders. Because we are trail users ourselves, we know the types of experiences that different groups are seeking. We are able to provide those experiences while taking into account social and environmental factors that influence trail design and construction. Susan Stormer creates routes so equestrians and other recreational users can enjoy nature while making a minimal footprint. Equitrekking: What are your favorite parts of the job? Susan Stormer: I love being outdoors and active for the majority of my working life. I enjoy learning new skills that I never expected I would acquire, and I get paid to do my hobby. I create ways for more people (and their horses!) to get outdoors and experience nature in a productive, responsible way, which promotes public health. Seeing the smiling, happy faces of people who enjoy using a trail that our company created is the best part. Equitrekking: What are the biggest challenges you face in your career? Susan Stormer: Often it's the weather. I love that I don't work in an air-conditioned cubicle; however, sometimes it can be not only physically uncomfortable but downright hazardous. Out in the woods, conditions can change unexpectedly. We do check weather reports and radar both before starting work and while in the field so we can plan accordingly. But, sometimes Mother Nature still has a way of dictating how well we can do our job or whether we can even do it at all. Mechanical trouble can also cause some frustrating and costly delays. We use machinery such as small bulldozers, chainsaws, rock haulers and plate compactors in our line of work. No matter how well one maintains equipment or plans for potential problems, parts wear out and things will break down. This usually happens at the most inopportune times and often in the most remote locations. Fortunately, Ryan has become an excellent improvisational mechanic, and I am a skilled assistant when it comes to facilitating field repairs. Equitrekking: Do you have any interesting stories to share from your work, and have you worked on a particularly rewarding trail project? Susan Stormer: Definitely! After 17 years in this line of work, I'm not sure where to start. I still remember one of the first paid job sites that Ryan and I traveled to in February of 2003, located in Big Bend National Park near Terlingua, Texas. We tent camped in the park, and we had been awakened late at night by a large animal exploring our site and sniffing around our heads through the tent fabric. Although it was nerve-racking, we eventually fell back asleep. I woke again before dawn. I went outside to sit on a boulder, watch the sunrise and listen to the desert come alive. On that beautiful morning I realized that I was sitting in my new office and that my life was going to become a lot more exciting than I had ever imagined. Making responsible trails involves a lot of careful planning to preserve natural features and minimize damage to the environment. On another job, I rode horses with TPWD staff in Palo Duro Canyon State Park. Our mission was to explore land for horse trail development and to visit an archeological site that had protected ancient rock art. One time in Pennsylvania I got caught in a thunderstorm while driving a very top-heavy dozer with an auger attachment on its front end through extremely rocky, elevated terrain. That was rather terrifying! I've also worked with at-risk youth on several trail projects, and it's always fulfilling to share what I do and spark a love of the outdoors in them. We can teach them how to execute a skill that they'd never tried before. Watching a teenage girl who had never swung an axe later dig up a tree stump like a seasoned trail pro is a very gratifying sight to behold. Even when I'm not working, I'm still using trails or doing occasional volunteer work on them. So as a result of our livelihood, Ryan and I have traveled to all 50 states in the United States. I've ridden horses in a lot of those states and a bike in all of them. I've also been to several other countries outside of the U.S., and using trails around the world has improved my life immeasurably. 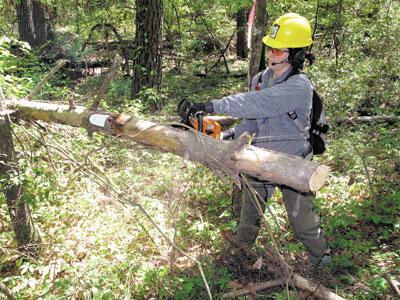 Using chainsaws and heavy equipment is part of the trail builder's skill set. Probably one of the most rewarding trail projects I've worked on is the Slaughter Creek Trail in Austin, Texas, the place I've called home for the past 14 years. Austin is blessed with a great outdoor environment and an active populace, but until recently most of the trails were located on the north side of town. I live on the south side, and now my friends and neighbors have access to a five-mile trail that was designed and built specifically for hikers, mountain bikers and horseback riders to share together. It's a public park that was created through great partnerships between the city and stakeholders from various user groups. My company was responsible for about 60 percent of the construction, and volunteer groups and community business partners were responsible for the remainder of the project. When I go there, I not only get to enjoy the trail myself, but I see friends and families having fun together. I've even seen a small group of kids with disabilities riding therapy horses there with their coaches and parents. That just warmed my heart, and it reminded me of why I'm so lucky that I get to do what I do for a living. Equitrekking: What are some tips for horseback riders using trails? How can we enjoy nature while making the least impact? Susan Stormer: Following the Leave No Trace principles is a good start. In essence, ride responsibly and with respect for nature and other trail users. Check their website for further details. Ride on open trails only – Respect private property and trail closures. Leave no trace – Don’t ride muddy trails! Control your bicycle – Or horse. Very hot or green horses need more training before leaving the arena! Yield appropriately – Hikers and mountain bikers should yield to horseback riders, but being on a horse doesn’t prevent the need for equestrians to be friendly, polite trail users as well. Never scare animals – Try not to intentionally spook wildlife. It’s not kind to the animals, and it could also spook your horse instead. Be considerate of other horse riders too. If your horse is balky, very excitable or a kicker, you should be last in line. 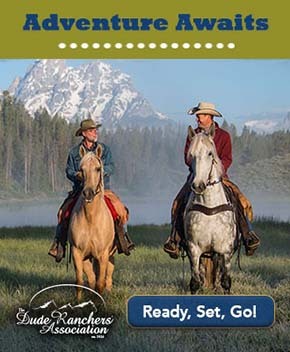 Plan ahead – Know you and your horse’s limits, and plan accordingly. Equitrekking: If someone would like to get involved with trail design and maintenance either as a volunteer or as a career, what steps would you suggest taking? Susan Stormer: Get some training first if at all possible so you know what you’re getting into and so you can be safer while doing responsible, productive work. If you’re located in Texas, please contact me directly, and I’ll try to either work with you myself or connect you with somebody else in my local network who can provide you with training. Deciding where to construct pathways is a careful task, and many organizations offer education for trail builders. If you’re located elsewhere in the U.S., the International Mountain Bicycling Association (IMBA) has a trail training service that my earlier career was based upon. You can search their website to see if they are offering any programs in your area. Although primarily bike focused, they welcome other trail users including equestrians because the principles of sustainable trail design and maintenance are very similar across different user groups. 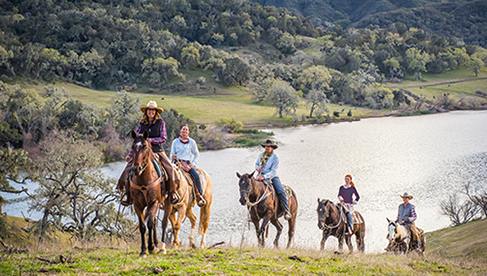 The American Endurance Ride Conference (AERC) is another group focused specifically on horse trails that offers training courses for trail riders who want to get involved. You can also investigate Recreational Equipment Incorporated (REI), because they sponsor well-organized trail work days that are nicely supported and provide a great way to give back to the community. If you don’t have the time or ability to get some formal training and you just want to get outside and work ASAP, I would ask you to do the following: get permission before doing any work! Find out who owns or manages the land and let them know that you’d like to help out by doing trail work. Rogue trail building and unauthorized maintenance only create more problems down the line, including loss of goodwill with land managers, safety concerns, negative environmental impacts and even trail closures. After you get permission to do work, make sure that you take your own safety and the safety of those around you into account. Wear eye protection, closed-toe shoes or preferably boots, and definitely long pants, even if it’s hot out. Long sleeves are recommended too because they provide protection from cuts and scrapes and itch-producing plants. Work gloves are a necessity to protect your hands from blisters and scratches. Sunscreen is always a good idea when working outdoors, and take enough water and food along to provide you with fuel for the calorie-burning physical labor. If you have any allergies, particularly to bee stings, make sure you have the right medications with you. I personally don’t do trail work while riding on the back of a horse (or even from my bike, for that matter). I prefer to focus on those tasks separately and give each of them my full attention when I’m doing them. But if you choose to do so, please take your horse’s comfort and safety into account as well. Make sure your mount has been trained to stand calmly in place while you trim high branches. Working in nature is a perk of being a trail builder. As for turning your love of trail building into a career, I would suggest going to the Professional Trail Builders Association website for more information. Our company is a member, and I sit on the board of directors for the association. We host a conference each year, which is a great way to learn more about the industry and how to succeed in it if you decide to make that your occupational path. Equitrekking: What skills and attributes are important for a trail builder? Susan Stormer: You can’t be afraid of hard, dirty, long hours of work. Dedication, perseverance, physical fitness, and a love of and respect for the outdoors are critical traits. The ability to use tools and sharp implements safely and efficiently is also necessary. You also need good communication skills, especially if you’re going to be a crew leader and train other people to be trail workers. Be able to listen, learn and accept feedback. Pay attention to detail, and develop good negotiation skills. I do a lot of work in private housing divisions, and I’ve had to placate more angry homeowners than I’d care to admit while I’m running a chainsaw or a bulldozer in their backyards. Fortunately, the majority of them have calmed down, and many turn out to be big advocates for and users of the trail. And in this line of work, a focus on safety is always critical. Susan Stormer traded her cubicle for trees and fresh air. I have a great job, and I feel fortunate to do work that I love while owning a business together with my husband. I also frequently get to work with friends and people that I care about. It’s fulfilling, rewarding and never boring. Sometimes I get paid to ride a bike or a horse on trails that I’m assessing or that I’ve just built. It’s also a lot less glamorous at times than it sounds, especially while answering the question, “So what do you do?” at a social gathering. And it’s certainly not a get-rich- quick (or ever) type of career. But I wouldn’t trade it for the world. Susan Stormer, Ph.D, welcomes your questions and is happy to share trail experiences with other outdoorsy folk. Contact her at (713) 448-0161 or by email. Learn more on the S&S Trail Services, LLC website.